Surely, this is too good to be true. It would appear that some German scientists have produced a seaweed wine using whole brown seaweed which they state will help improve eczema. Seaweed is fat-free, low in calories and full of vital minerals such as calcium, phosphorus, magnesium, iron, iodine and sodium. 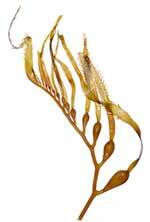 The article states that seaweed also has other health benefits. It is able to remove radioactive strontium and other heavy metals from the body by binding with the toxins in the intestines and carrying them out of the body. This prevents the toxins from being excreted through the skin as is the case in eczema flare ups. If wine is not your thing seaweed can be found in other foods. Sushi as we all know is wrapped in seaweed. The Japanese also add seaweed to soups, broth’s and desserts or eat it as a snack. Some cultures use forms of seaweed in breads, relishes, soups and fritters. All sounds good….it is the flavour of seaweed in a wine that worries me. I wonder if grapes have the same nutritional benefits?